Boy this has been a busy week and next week will be even worse. 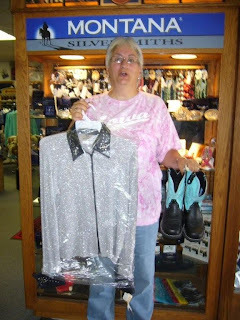 We went to Des Moines today to pick up my layaway of my silver and black glittery rail shirt and boots. Ended up getting Bill a new pair of boots. He wears his cowboy boots all the time and I can never keep a pair we might even be able to call them "good" boots. But he truely wears his out. Anyhow by the time we left Hawkeye Tack and Western Wear we spent another $320 (counting the boots - expensive!!) with EZ All body wash, the little razors you use by hand, moisturizer for Mocassin's coat blah blah blah. Now I am exhausted and I really wanted to ride Rosie today. Maybe I'll take a quick nap then take a quick ride. Sounds good - see ya later!!! Yes I certainly will bling. I have lost 20# since that pic was taken. That was the day I put the boots and blouse layaway. I have lost a total of 50# since Jan. '08. I'm trying to lose 30 more so I can get myself into a shape to ride a svelte 3 year old. Can't wait until you girls can see HER pictures. She is awesome - but she's still 3. I guess ride hard and take chances.